Playify can be used by you alone or in a group of preferably 3-4 people. A notepad, to scribble down your ideas in. - What behavior are you trying to change, and in what particular situation? - What behavior oriented business goals are you trying to reach? The more specific a goal you start out with, the better ideas will come from your Playify session. So try to limit yourself. You can't change everything at once. Start small! What are the attributes of the people you are designing this experience for? Or what kind of people would you like to design an experience for? You can't design an experience for everyone, so you'll either need to select a few common qualities among your audience, or choose to work with a specific type of person in your audience. When choosing cards, divide them up between you. Each person can read the backs of their cards and pick out any potential candidate to propose for the board. All games have challenge. Without it, there is no reason to engage and no value in rewards. The same is true for real world activities. Here you'll will get some suggestions for different types of challenges to build your concept around. Choose just one challenge to work with per session. The mechanics are what activates your player. Here you'll get general ideas for ways to to that. Not all mechanics will be applicable to your project, but with the help of your imagination, you'll find ways to apply some of the concepts within your particular context. 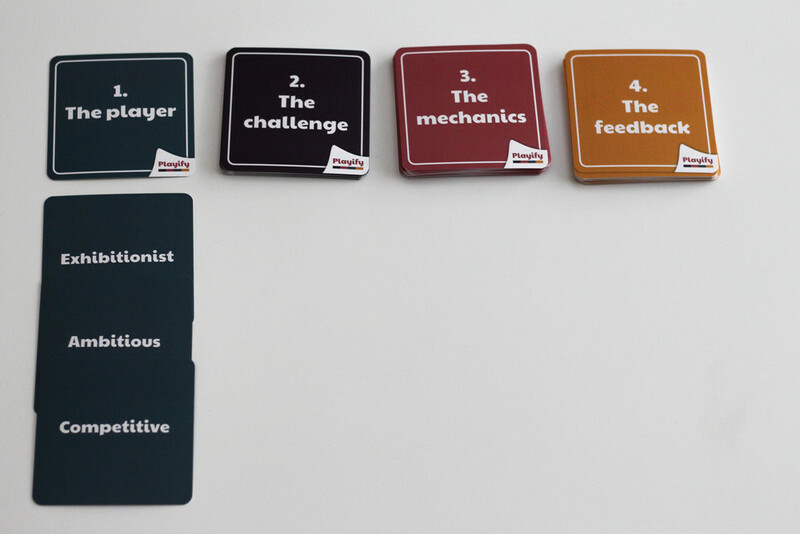 Stop at each card and imagine what this concept could look like within your product, activity or organization. There are multiple ways of interpreting each word. What can you do to positively reinforce your player’s behavior? What would be some proper rewards for their good efforts? The key to choosing the right feedback mechanisms is understanding your player and their challenge. So look back at your selected cards: they will give you the clues. You can also read the backs of the feedback cards to get ideas for when they are most applicable. So... All your cards are on the table, you have elaborated upon them with your own ideas, and you are starting to see a potential gamified project take shape. What are the next steps? Continue experimenting. Review your cards, refine your ideas and start working on a more concrete specification of your project. Scrap the concept and start a new session. You’ll come up with new ideas every time you use Playify! If you feel that you're on to something interesting, you might want to involve a gamification consultant to get help in developing your project and to make the right decisions along the way. But you could just as well keep using Playify on your own, as a way to play around with ideas or to try and solve specific challenges. Order your copy of Playify today!